I was searching Pinterest for ideas and a few clicks and websites later I came upon this adorable idea. Just click on the link above and it will take you to the blog post and printables to make this perfect Father's Day gift. I didn't use all the printables given, but chose a few that worked for me. 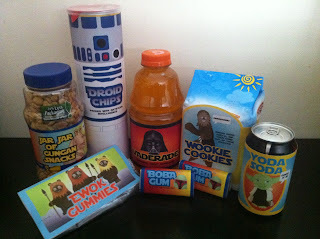 My husband loves Star Wars so this will be cute for the boys to give him in on the morning of Father's Day before we head to the baseball field. We will make him breakfast and have this in a basket for him. I think it will put a smile on his face. I just found your blog Jaime and I'm your newest follower. Fathers Day is the hardest to shop for!! I can never find the "perfect" gift. I love your idea though, so creative and useful! Oh what a great idea! I love it!! Hi Jaime! I found your blog via The Idea Backpack! I'm your 26th follower!